Moths are not the only insects that will damage fabrics. Crickets, silverfish, grasshoppers, etc can do damage. The single best thing you can do before storing a garment is to clean it. An invisible spot of your favorite soft drink, accidentally spilled and long since forgotten, will provide a nice supper for the voracious little insects. The insects are not concerned if part of your best sweater happens to get eaten along with supper. Insects will eat any garment, even a 100% polyester garment, to get at their supper. A good cleaning also flushes all the air pollutants out of your garments. So before storing, give to the cleaners that which is the cleaners’, and to the washing machine that which is the washers’. The important thing is to have your garments clean. To openly store garments, as in a closet, spray your closet with an aerosol insecticide. An inspection and evaluation of available products on the grocery store shelves revealed that flying insect type of insecticides are safe. Insecticides have a limited life and will need to be periodically resprayed every two or three months. To store garments in a container, use a container (plastic bag, box, cedar closet, etc) that will prevent insects from entering and laying larva. I prefer a cardboard box because it will breathe. Avoid folding the garments with sharp creases that will weaken the fabric. Seal all the edges with tape. And what about cedar chests? Somewhere I have formed the idea that cedar chests repel insects for several years. After that their effectiveness is more from being able to keep insects from contacting the garments. Insects need water to survive. Try to have the storage place dry. Do not use cellars and damp garages. If you store your garments in an attic, take special care with brightly colored garments, red in particular. The heat of a summer attic can. affect dyes causing them to stain adjacent garments. The U.S. Wool Bureau offers these tips on protecting garments from moths. 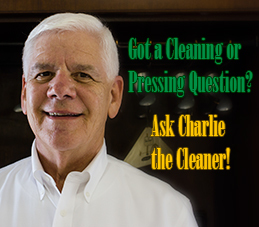 Make sure articles have been cleaned thoroughly before storing them away. Moths are drawn to soiled areas on garments. 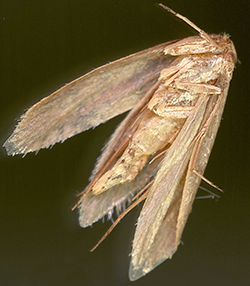 Moths will eat nearly any fiber, especially those that are soiled. To get the most protection for hanging garments. hang the mothballs or crystals in, a ventilated container on the hanger. The vapors from the balls or crystals are heavier than air and will fall, not rise. Do not store garments with mothballs or crystals in flimsy plastic bags; the vapors will eat right through the plastic. Use airtight storage boxes, if possible. If you hate the smell of mothballs or crystals, use a nonresidual spray, applied directly to the garments. Sprays containing allethrin, pyrethrin, or resmethrin (sprays labeled “flying insect”) are safe. - American Drycleaner, June 1984.